We recently received an 1897 copy of the Report of [New York] State Superintendent of Public Instruction. The book is damaged and most of it doesn’t relate to Geneva’s history. 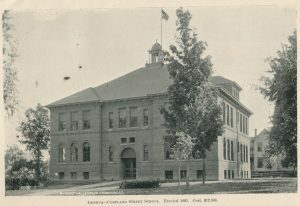 However, the relevant pages are in the Appendix, “Views of School Buildings.” There are photos and floor plans of Cortland Street and Lewis Street schools. The featured schools were built over the previous decade and ranged in cost from $900 to $120,000. Many schools built in the first decades of the 1900s shared a style called “scholastic architecture.” The old Geneva High School was a good example of the scholastic style. The 1897 report shows a wider variety of architecture. 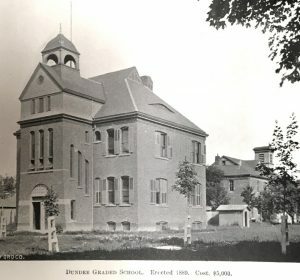 This was the Dundee Graded School from 1889. I like the three side windows on the tower that probably lit a stairwell. 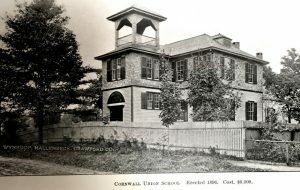 The Cornwall School, in the Hudson River valley, could be mistaken for a house. The size of the building and proportions of the windows are less imposing than most schools. Built in 1896 in the Catskills, the Hunter Union School was the most expensive of these examples at $16,500. This feels like a combination of the first two buildings: larger scale but with style features found on houses of that time. 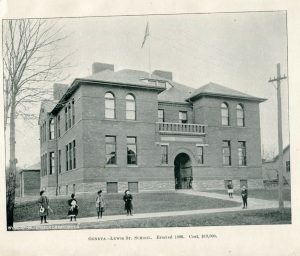 Cortland Street School was built in 1895 for $12,500. 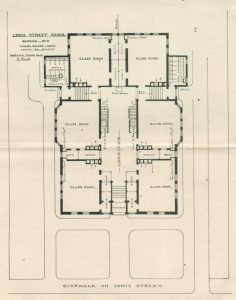 It was designed by architects Pierce & Bickford of Elmira who also drew plans for the Smith Opera House and the original YMCA on Castle Street. Separate boys and girls playrooms were in the basement. 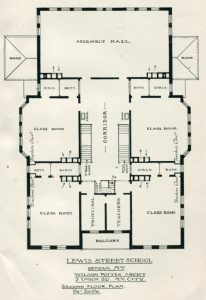 The first and second floors had classrooms, toilets, and coatrooms, and a teachers’ room and prinicpal’s office. It had all the basics of a one-room schoolhouse in a large four-square block. Potter followed the same plan as Pierce & Bickford but added a wider addition on the back of the block. This gave two extra classrooms on the first floor and an assembly hall above that. Both schools lacked libraries and cafeterias. I found many class photos but little information about any changes to the buildings. In 1939 Lewis Street was closed due to declining enrollment. It was reopened in the 1940s to train sheet metal workers and draftsmen for World War II. Geneva Historical Society used two rooms of the school in the late 1940s. 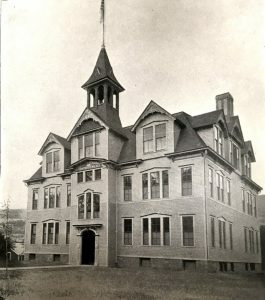 After several other uses, the school was torn down in 1970. Cortland Street School was auctioned off in the mid-1960s and eventually converted into apartments. I assume the school closed when West Street School opened in 1957 to serve the southern half of the city. The architects’ drawings for these two schools add to our collection, but we can always use more information. Do you have photos or information about the schools’ interiors in the mid-1900s, prior to closing?